The 'Astor Apartment House' designed by Trowbridge & Livingston c. 1901 at Fifth Avenue and East 55th Street in New York City. Most will recognize this as the St. Regis Hotel, which it became by the time it opened in 1904. 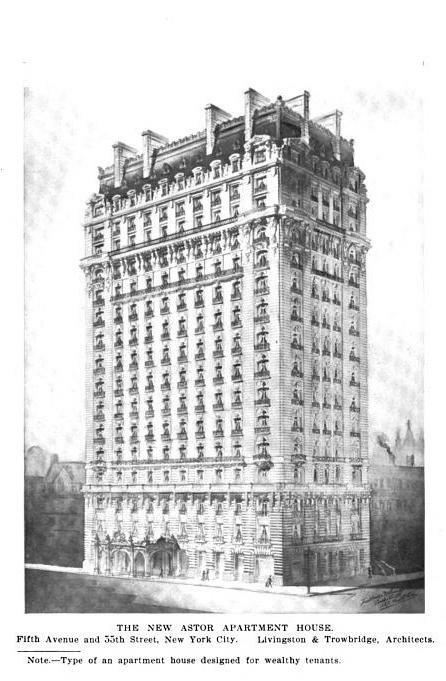 The sketch suggests the building was originally intended as a high end apartment building and at some point was converted to a hotel (Astor had originally intended to build houses on the site). When it opened the NYTimes called it "the most richly furnished hotel in America" and cost $5,500,000 to build and furnish. Guests who could afford the $125 a day room charge were treated to numerous modern luxuries including a $300,000 air filtration system that removed a barrel of dust a day. Click HERE for more on the St. Regis Hotel and HERE to see it on google street view. 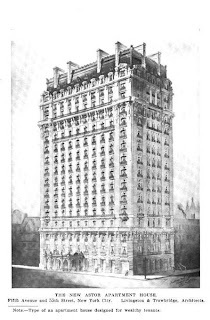 Image from Architectural Record, 1901.